The Japanese persimmon is a magnificent tree, useful and perfectly adapted to the Portuguese climate. Diospyros kaki L. is well known for its autumn colours. Leaves turn red, yellow and orange in November and the bright orange fruit stays on the tree long after it has lost its leaves, giving a unique show. The name first appeared in around 450 B C, in the writings of Kong Ji, grandson of Confucius. The fruit has high levels of anti-oxidants, carotenoids and tannins recommended for treating many current health concerns. Modern research aims to allow year round consumption of fresh fruit. The Universitat Politècnica de València published a study in November 2014 on persimmon milkshakes and the chinese are working on treating dried persimmons with an extract of fresh fruit to conserve the antioxidant properties. It is a promising fruit, grown industrially in Asia, and worth developing in Portugal. Persimmons were first domesticated in Northern China, it is a high altitude sub-tropical tree which is not very demanding and adapts well to the Portuguese climate, including the interior regions, and is hardy to -12° C. In Europe they are grown in the same climatic zone as fig trees. They like deep rich soil where they can find moisture, non-irrigated trees are traditionally planted in valleys, or where brambles grow, indicating moist areas. In dry terrain they need regular medium irrigation in summer. Like other fruit domesticated in this region (there are approx. 2000 cultivars in China), there are centres of secondary domestication including Japan (800 cultivars, 150 described) in the Black Sea region, Caspian area and also in Spain. Acclimatization to the Mediterranean climate was late (19th century) and rather random. Japan has done an excellent job in selecting fruit adapted to its climate and its customs. This slow growing tree has beautiful wood, as you would expect from a tree in the Ebenaceae (Ebony) plant family. In Asia it is sometimes trained to grow low to the ground or even espaliered. Pruning to a low profile makes fruit harvesting easier which is important as the overripe fruit is very messy when it falls. Unpruned, a persimmon tree will reach 15m in Portugal. Once the initial pruning is finished (aimed at spreading open the tree by removing the central leader to encourage lateral branching every 50cm) it is better to prune no more than once a year and very little as the tree responds by increasing vegetation at the expense of fruit, as in peach trees. Remove dead branches, shorten the shoots or branches growing from previously dormant buds (known as epicormic shoots) to encourage lateral shoots and horizontal growth. Fruit develops on the current season’s growth. August on is a good solution but the netting can be heavy for the persimmons supple branches. The best solution is to bag the fruit in textile mesh socks as soon as they start growing (July/August). 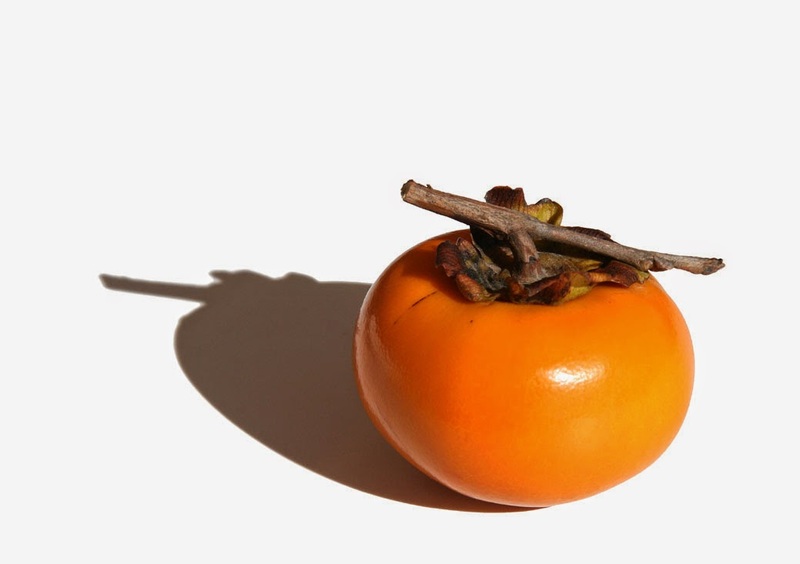 There are two types of persimmons : non-astringent and astringent. Among the non-astringent varieties, the ‘Fau-Fau’ cultivar is common in the Algarve and highly recommended. The fruit is small and matures in October, they can stay on the tree for a month before softening. They are crunchy, tasty, and can be served warm with autumn game. The astringent variety most common in Portugal is the ‘Coroa de Rei’ which is another name for the common and very productive big Japonese persimmon ‘Hatchia’, with a high sugar content ( Brix 17°). It is the fruit most commonly used for air drying and matures late in the year. I recommend an earlier ripening fruit that will dry more easily in the sun and winds of October such as the ‘Rojo Brillante’ which is common in Spain. Drying changes soluble tanins into non soluble tanins. Other ways to remove bitterness are by leaving the fruit in a closed jar for 3 days with a little alcohol, (e.g. good brandy), or by soaking in water at 38°C for 24 hours. It is easy to be tempted by a collection of japanese kaki trees considering that they are good for your health and that they ripen just before citrus fruit and just after grapes (another good fruit for drying). Ripening is slowed by altitude. Here are my links to give you an idea of harvest dates of different cultivars.